Poland is now an official monarchy - if you believe the Catholic Church. In a ceremony in Krakow Cathedral, reportedly attended by government officials including President Andrzej Duda, Jesus was crowned King of Poland. The ceremony was also attended by 'huge numbers' from Germany, Canada and the United States as well as from the rest of Poland. This is not the first divine monarch to occupy the Polish throne. 350 years ago the Virgin Mary was declared honorary queen of Poland by King John Casimir. The movement to have Jesus crowned King of Poland was started by the Catholic nurse, Rosalia Zelkovam, who reported hearing a voice claiming to be Jesus, telling her that he demanded to be crowned King of Poland. Apparently, the likelihood that this really was the voice of Jesus and not a woman hearing voices in her head can be safely excluded despite the fact that no-one else appears to have seen or heard anything, as seems to be the routine with Catholic 'miracles' and divine revelations. This coronation comes after earlier attempts to enthrone Jesus was defeated in the Polish parliament in 2006 which were dismissed as 'dangerous' (sic) despite receiving the support of 10% of deputies to the lower house. Then as now the move was supported by far right groups such as the League of Polish families (LPR), the conservative Law and Justice (PiS) party and the Peasants' Party (PSL). In Poland, as in America and many other countries, just as Europe in the 1930's and 1940s, Catholics are closely associated with far right nationalists. Christ doesn’t need a parliamentary resolution to be the king of our hearts. These lawmakers would do better to look after their constitutional prerogatives and let religious institutions and the Church do our work. 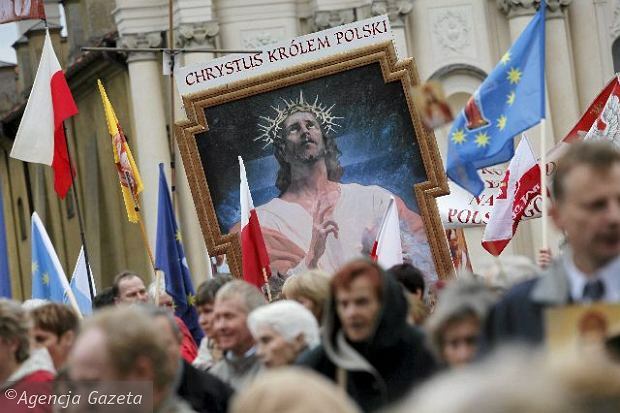 Although his dissent appears to be on theological grounds, arguing that Jesus is aready King of Poland anyway, despite what the Polish government say. The Catholic Church gets to decide these matters, apaprently. It has nothing to do with the Polish people or their elected representatives. Taking away this priviledge would undoubtedly be persecution and a violation of their human rights.